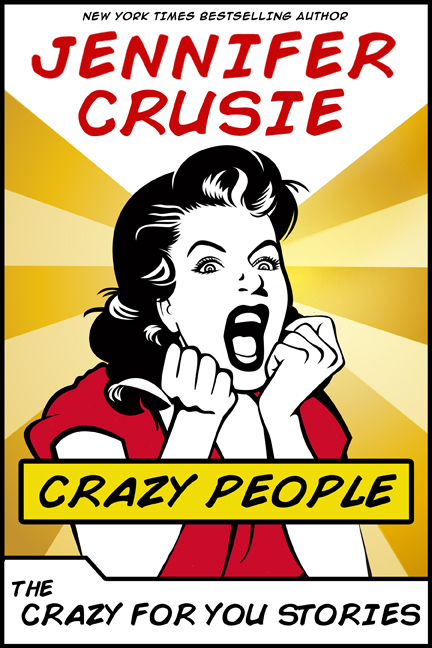 For fans of Jenny Crusie, of witty and warm writing, and of contemporary fiction, this collection of short stories was the genesis for one of Crusie’s most beloved novels, Crazy for You. The stories focus on three women, Quinn, Darla, and Stephanie, and their mothers, sisters, daughters, and friends. Originally written for Crusie’s MFA in Fiction, they’ve been updated, edited, and packaged as a special collection for any reader who loves to laugh out loud. Once upon a time, I went to school to get a Masters of Fine Arts in Creative Writing. No, that’s not true, I went to get a PhD in feminist literature and got co-opted into the Creative Writing Program when the head of the program stopped me in the hall and said, “I hear you’ve published a novel.” You really have to know Lee K. Abbott to appreciate how startling that was: big guy, looks like the Marlboro Man, terrifying in his reputation for grilling students. And then there was me: frumpy middle-aged woman who’d written three novels for Harlequin, only one of which had been published so far. So I pushed my glasses back up my nose and said, “Uh, yeah, but it’s for Harlequin,” and he said, “I don’t care who it’s for, you should be in the program.” My brain shorted out about then, but Lee is not somebody who gives up, so I agreed to audit a creative writing seminar. Just dip my toe in, wait for somebody to make fun of me, and then leave. But as it turned out, the only biased person in the program was me. As far as I know nobody else gave a damn who I wrote for, they just wanted to write good fiction, although the lack of cheap shots might be in part attributed to the fact that Lee stood in front of the class the first day and said, “Anybody who makes fun of romance fiction is making fun of Jane Austen, and anybody who makes fun of Jane Austen answers to me.” Why yes, I would walk across broken glass for that man. Why do you ask? I won’t say I don’t have scars from the experience, but every one of them was necessary. When he critiqued the first draft on one of the stories in this collection, “Just Wanted You To Know,” he said, “I already knew Jenny could make me laugh. But it matters the way she gets the laugh.” Then he went through the story page by page and said, “Here you went for the cheap laugh. And here you went for the cheap laugh. And here …” He was right. And every time since, whenever I write something that’s strictly for the laugh, I can hear Lee saying, “Here you went for the cheap laugh …” and I delete that sucker without hesitation. Lee K. Abbott taught me to write, and I am grateful to him every day for that. The most difficult part of the program was that I had to write mostly short stories. I think writers are born to the length they’re best at. Some of us are born sprinters and some of us are born marathoners, and I was born for the long form. But people in MFA workshops get hostile when you ask them to read entire novels and critique them, so I learned to write short stories. In the process, I discovered that the short form is also the shortest path to discovering character, and as I worked my way through writing exercises and stories, I discovered a character I wanted to spend more time with: Quinn McKenzie of Tibbett, Ohio. It took some time, but eventually I started Quinn’s novel, full of characters I needed to know more about, so as the writing exercises assignments and workshop story assignments piled up, I pulled out characters from the assignments and put them in the novel, and then pulled characters from the first drafts of the novel and wrote short stories about them. In the process, I found out more about them than I ever would have within the confines of Quinn’s story. Turns out when you give a minor character her own voice, she has a lot to say. Eventually, Lee pointed out that I had to graduate—I’d have stayed forever if I could have—so I put together my master’s thesis of the short stories I’d written during that time and the book proposal for Quinn’s story, then called Dog Days. I turned the thesis into Ohio State, graduated, and went on to write Dog Days, retitled Crazy For You and then other novels for St. Martin’s Press. These stories pretty much gathered dust on my hard drive (with the exception of “Just Wanted You To Know” about which more later) until the author-as-digital-publisher revolution hit, and it seemed like the time to resurrect Quinn and Zoë and Darla and Debbie and Meggy and Caroline again. So here they all are. For those of you who’ve read Crazy For You, I hope this collection is fun, an inside look at the some of the characters you liked (or didn’t like). And if you haven’t read the book, I hope the stories stand on their own, pieces of a small town in Ohio that runs on gossip, friendship, and love. They’re stories I’d thought would be lost forever, so I’m grateful for the chance to publish them, and even more grateful you’re reading.